Eternity Summer 2015 (shown above) ~ a fresh fruity fragrance; "Eternity Summer begins with the freshness of green pear brightened with a splash of dewy watermelon and juicy mandarin. The heart blossoms with lush peony petals, sweet blue hyacinth and vibrant water lily, then dries down to the seductive warmth of creamy sandalwood, soft white amber and sensual musk." $64. 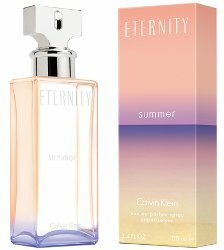 Eternity Summer Men 2015 (shown below) ~ a fresh fougere fragrance; "Eternity for men Summer opens with an energizing burst of grapefruit and spicy black pepper, mingled with an uplifting ocean air accord. Aromatic notes of fig leaf, cypress and juniper berry impart a rich, confident masculinity that dries down to an enveloping signature of warm driftwood, sensual musk and magnetic amber." $70. 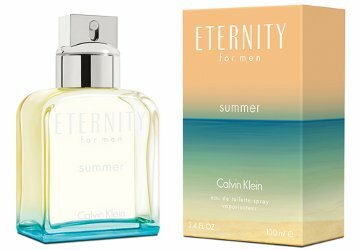 Calvin Klein Eternity Summer and Eternity Summer for Men 2015 can be found now at Von Maur, in 100 ml. Energizing, uplifting, aromatic, rich, confident, enveloping, warm, sensual, magnetic. They’re gonna run out of adjectives if they’re not careful. Nonsense, it’s ETERNITY. They can go on forever. Ha! I find the bottle this time around oddly attractive. I’ll sniff this one just on the off chance it might strike my fancy enough to get some, and have that bottle sitting around this summer. First time I have even thought about smelling any of these. Relentless marketing pays off I guess. They are much nicer looking than some years.